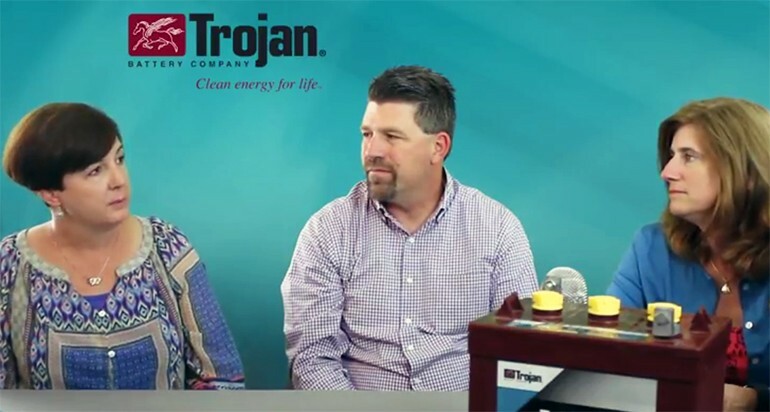 We recently sat down for Part 2 of our interview with Jeff and Stacy from Trojan Battery Company to talk about the latest battery technology – smart carbon. Watch Part 1 of our interview. Can you give us an idea of what smart carbon is and what its advantages are? We came up with smart carbon as a solution because we realized that not all batteries are fully recharged everyday, you know, in an ideal world they would be, but they’re not. So, because of what’s called partial state-of-charge condition, we developed smart carbon as a feature that’s added to our negative plates. The additive increases the plates conductivity, so the battery accepts charge better and faster and the end result is, even in a partial state-of-charge application, the batteries will last about 15% longer. Which product lines have the the smart carbon? We offer the smart carbon additive in our RE (renewable energy) line. If you know anything about the Trojan product. it’s going to be the yellow cap and they are identified with the smart carbon label, so that will be in our RE line. It’s also included in all of our industrial line batteries. So those are the much bigger batteries with the higher amp hour, generally the smaller voltage? Is smart carbon an additional feature, an option, that has to be ordered with the batteries? It’s an additional feature, but it comes standard with the batteries, both in the RE line and the industrial line, so there’s no extra cost to it. You get the benefit automatically with those two batteries. So you’ve got just standard, longer lived, longer cycle and ability to live a little bit better with a partial state-of-charge? That’s great technology! Well thank you so much for coming in Stacy and Jeff from Trojan Battery Company. Ask the altE Experts: What’s Next for Renewable Energy?